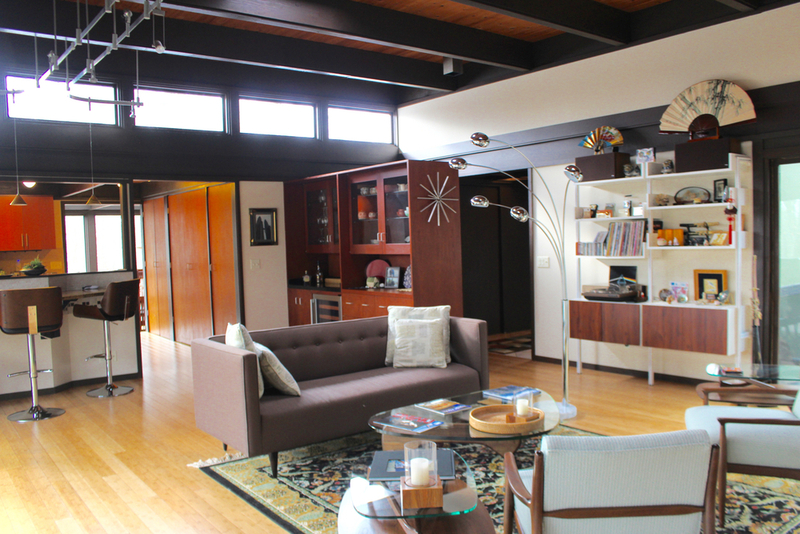 Three weeks after an interview with architect Norman F. Carver Jr. in his Kalamazoo studio, an owner wrote telling me about his Carver-designed home in Parkview Hills, and we scheduled a visit. One of the striking features of the home referred to here as the Katydid House is the harmony in the integration of the house and its site . The structure presents a low horizontal profile using Carver's trademark 4 x 8 modular form adapted from his extensive study of Japanese architecture. The owner, George Wilson, — a business consultant and former national and world champion diver, had the exterior panels painted green soon after he bought the home in 2013 — a color that is closer to the original. He painted the vertical boards a contrasting rich dark black that distinguishes the form. The exterior updating and repair was done by TR Builders, a form specializing in modern homes and owned by Tom Rigney. The house and site blend beautifully and we were told that it is nearly camouflaged when the trees are in full-bloom. To complete the exterior work, George commissioned a new membrane roof by Carlyle Roofing, a third-generation Plainwell, Michigan firm specializing in flat roofing and experienced with area Carver homes. Special features of the exterior also include the pretty decorative rain chains that are like house jewelry and were added with the serious purpose of breaking the fall of the water from the roof and directing it downward gently, minimizing erosion and splash. A pebble path encircles the house and emphasizes the rhythm in the structure as different sections move in and out of view. The site drops off in the back to create a dramatic elevation for the expansive deck and enclosed porch cantilevered out over the walkout patio. At the bottom of the hill is a community walking path and ample opportunity to view wildlife at close range. 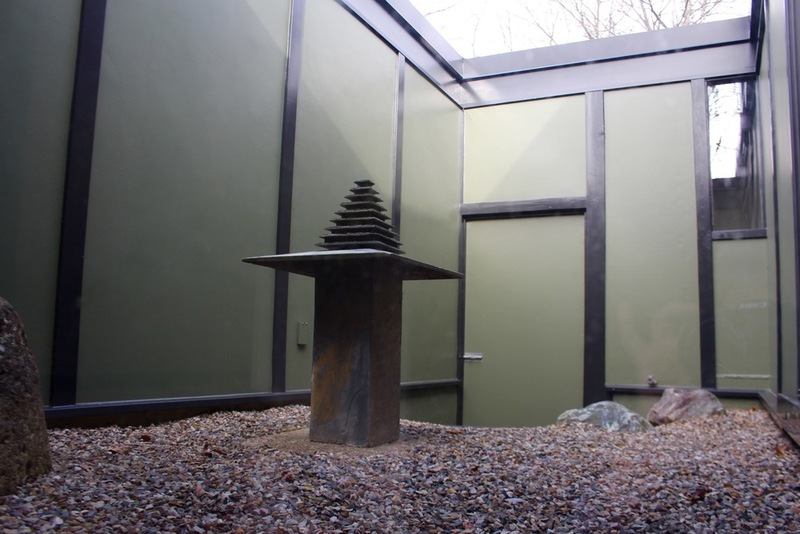 The site's minimal landscaping is a perfect combination of pea gravel, pebbles, decorative rocks, shrubbery, and ornamental trees. Only tiny bits of the interior are glimpsed from the outside, through the front door sidelight and through the windows of the combination sun-room/dining room. First impressions are of a private and subtle though stylish private one-floor home. On entering the space you feel cloistered for only a moment and immediately experience the Frank Lloyd Wright-style reveal — moving from cozy entry into open plan living space with floor to ceiling window walls. 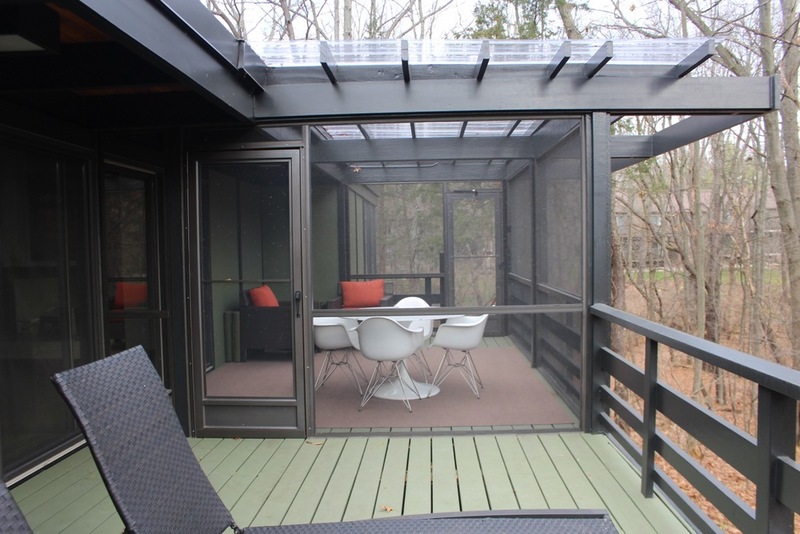 The room is light and airy like a tree house, with views of the beautiful natural setting beyond the deck. In the living room the vaulted tongue and groove pine ceiling has exposed beams with track and canned lighting and skylights. Light fills the space from the horizontal band of clerestory windows over the kitchen counter and from glass sliders opposite the back wall that lead to a quiet inner courtyard. 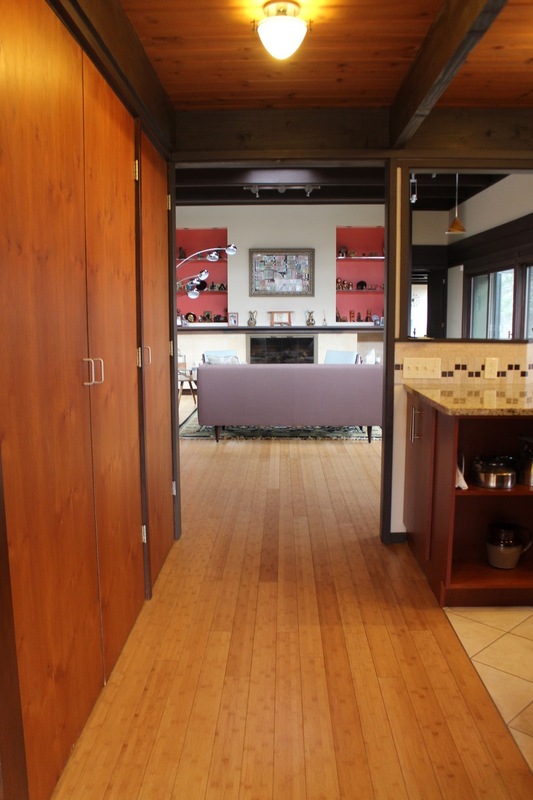 New bamboo floors brighten the space and add to the modern feel of the house. One suspects that the marble fireplace facade was once brick based on viewing another Carver home nearby. A wall system by ISS (Infinite Storage Solutions), a California based company, is both decorative and practical. The deck on the back of the house is covered with a trellis-style overhang. Part of the deck is enclosed as a porch and eating area that culminates in a circular stairway leading to the walkout level. George painted the handrail a bright orange that really "pops" in contrast to the green exterior panels. A brand new expanded kitchen has erased some of original design aesthetic of the home, but it is no surprise as a modern and efficient kitchen is a top priority for homeowners. From the kitchen you enter the dining room, a sheltering space with floor-to-ceiling glass window walls and a low beamed ceiling. The master suite is part of a reconfiguration of space from two bedrooms to one and a nice added amenity is the generous walk-in closet. 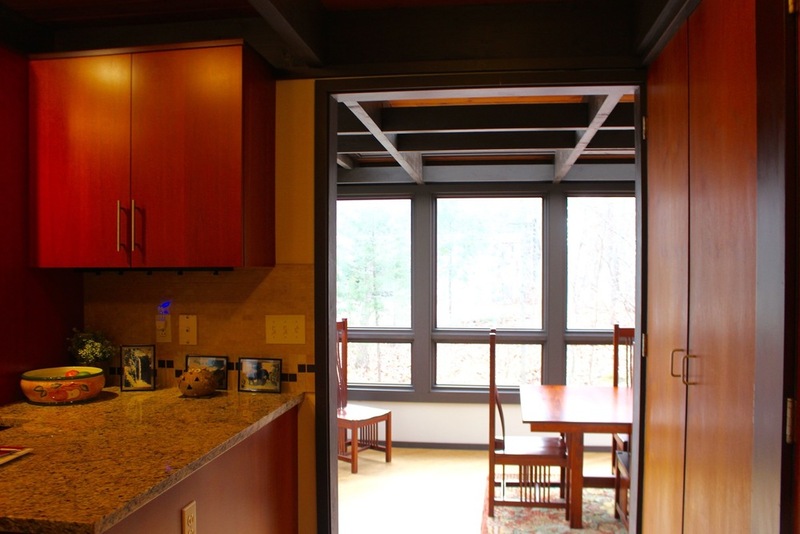 However, the dropped ceiling unfortunately hides another set of horizontal clerestory windows. 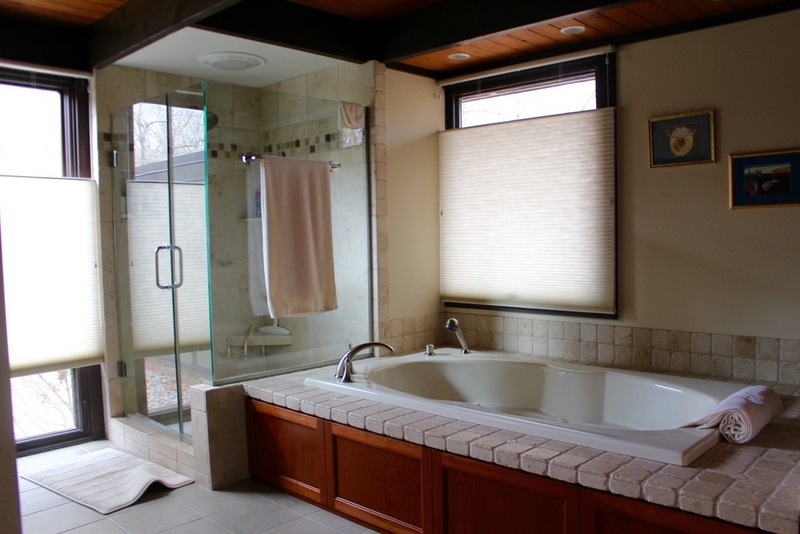 The enlarged the master bathroom has new 12-inch square floor tiles, a tiled shower with glass walls and a garden tub with tile surround. Not usually a fan of carpets, I was pleasantly surprised by the striking cream colored wall-to-wall master bedroom and lower level carpeting. George gave the entire walkout level a new look. George decorated the living area with a stylish ISS wall system and sleek modern furniture and also redesigned the guest bedroom and bath. On the walkout patio we found an original artifact of the home, a decorative Japanese lantern that used to hang in the front of the house, similar to some that I have seen in Carver's book Form and Space in Japanese Architecture. Beautiful built-in cabinetry of veneer covered plywood replaced during the remodeling can be seen in the work room. George has a history of renovating modern spaces, in his previous homes in Salt Lake City and in Palos Verdes, where he restored a California modern home. Understanding what is involved in bringing back the beauty of a home with great bones, he expressed gratitude for the fine extensive restoration work completed by the former owners. And here is a recent update to our story. More work has been completed since we toured Katydid House a year ago. George continues to complete the projects on his wish list. He just finished a renovation of a bathroom at Katydid House, and George shared photos of two perspectives of the updates. Katydid House is located in Parkview Hills, a neighborhood developed as a planned community. The homes are eclectic in style although there are at least six other Carver homes. One was owned by James and Mary Thorne and is important enough to be the only non-Frank Lloyd Wright home in Kalamazoo County to be listed in the Michigan volume of the 1993 Survey of American Buildings. As we were leaving we drove by that house. The owner was out in the driveway and gave us an impromptu tour of the interior. 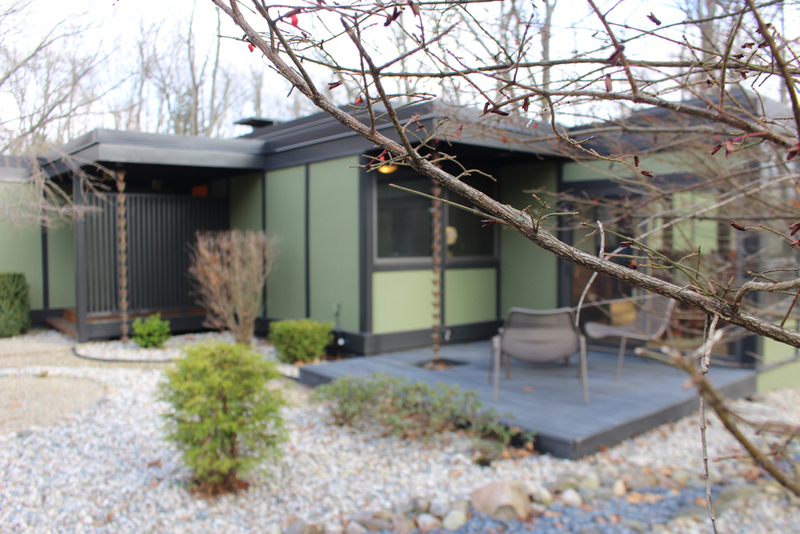 It is a stunning home that gave us a further opportunity to observe the integration of Japanese design in Norman F. Carver's architectural forms.